Snorkeling in Sardinia? Snorkeling at Cala Ginepro! Snorkeling in Sardinia is a unique experience if you do it at Cala Ginepro! On the sandy seabed, close to the beaches, you can admire a plethora of fish swimming in shoals or on their own. On the reef you can explore the rocky bottom with the oh-so-smart octopuses, catch glimpses of the enchanting starfish and play with the baby groupers! And if you haven’t got your mask, flippers, mouthpiece or wetsuit with you, don’t worry…at Camping Cala Ginepro, you will find all the gear you need available for hire on the beach. 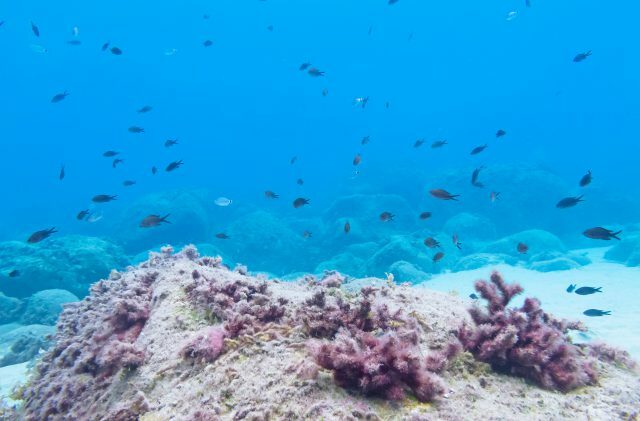 You can then make the most of the unmissable experience of snorkeling in the transparent waters of Cala Ginepro. Octopuses are mysterious, intelligent animals, equipped with a greater capacity for learning than other invertebrates. Indeed, the octopus does not require direct experience to act in new ways – rather, it can copy the behaviour of similar creatures simply by observing them. This is a common feature of the learning habits of mammals, but not of invertebrates! The scientific name of the common octopus is Octopus Vulgaris, and it belongs to the class Cephalopoda. The head and the body form a single unit with the mantle, and it has eight pair of tentacles or arms. Under the skin, the octopus has thousands of specialised cells: chromatophores. Each chromatophore contains an elastic casing that is pigmented – either orange, yellow, red, brown or black. This is because the octopus is great at camouflaging itself! When it feels threatened, it uses its gland to spray its so-called “ink”. The octopus is a fascinating, enigmatic creature: it can take on various forms and its skin can change colour more than 100 times an hour! Starfish are organisms that are as captivating as they are delicate: contact with human skin and exposure to the air, even only for a few seconds, can irreversibly damage their natural protection system. It is, therefore, good practice just to look at them and to avoid touching them. Starfish are invertebrates, also known as echinoderms, and they belong to the class Asteroidea. They love to lie undisturbed under the water, and they move thanks to a bona fide hydraulic mechanism on their skin, constituted by a complex system whereby they pump water via miniscule, invisible tubes. Starfish have negative phototropism: this means that they naturally move away from areas most exposed to light, preferring shade at all times. Look but don’t touch really is the mantra! It is one that applies to starfish and snorkeling in Sardinia in general, or indeed in any sea. Neptune Grass (Posidonia Oceanica), often referred to erroneously as algae, is in fact a plant – and one that is essential for the marine ecosystem. It grows only in the clearest, most transparent water, such as that around Sardinia, including Cala Ginepro. The green meadows of Neptune Grass, which is the type of seagrass found on the seabed of Cala Ginepro (and, indeed, most of Sardinia), are extremely important for sea life. The structure of the grass is so complex that it can play host to the most diverse micro-habitats, which are capable of serving as a shelter for numerous marine species. The prairies of Neptune Grass are the ideal refuge for the inhabitants of the sea, who also lay their eggs there during their reproductive period. The underwater meadows of Neptune Grass create an important barrier that lessens the power of the swell, stabilising and protecting the coast from erosion. At Cala Ginepro, it's easy to see amongst the rocks the offspring of numerous species of fish, such as grouper babies: they stand out for their brown colour featuring little splashes of yellow and white. It is important to remember that it is strictly prohibited to go fishing for even small fish, because aside from being illegal and unpleasant, it also makes it impossible for the fish to reproduce, causing irreversible damage to the ecosystem. The sea is generous, but it is crucial to be aware of the fact that in order to benefit over the long term from its resources for our lives, we have to respect it, first and foremost.